Robin Williams Talks To A Gorilla, You Won't Believe What She Asks Him To Do! I Can't Stop Laughing! 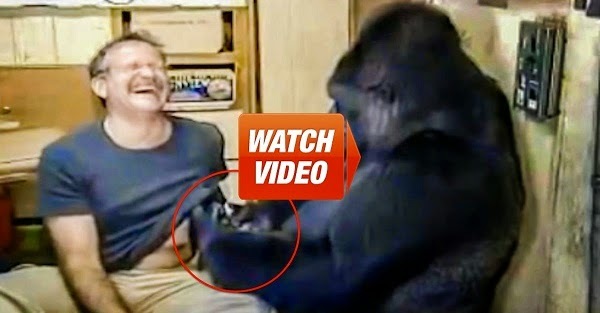 Home » »Unlabelled » Robin Williams Talks To A Gorilla, You Won't Believe What She Asks Him To Do! I Can't Stop Laughing! Watching a gentle Williams interact with Koko will melt your heart. At one point, right after Koko takes off and wears Williams’ eye glasses, she begins to go through his pockets and steals his wallet! Then, suddenly, Koko starts signing “tickle” to Williams. This sweet gorilla wants nothing more than to get tickled by this Hollywood heavyweight. Of course Williams obliged and cuteness ensures. Rest in peace, Robin. You will be missed.